Dunstable Town slipped to their third straight Southern League defeat as they were beaten late on by Leamington, who did the double over them, on Tuesday night. The visitors gave starts to Howard Hall and Gary Wharton, but it was the hosts who started well, with a move involving Sam Austin and Rob Ogelby needed to be cleared. 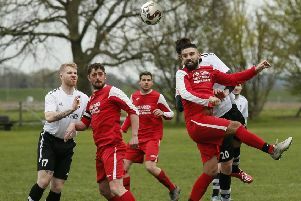 Dunstable’s first meaningful attack saw Connor Calcutt fire straight at keeper Tony Breeden, while Steve Wales was also denied by the home stopper. Jack Edwards tested Jamie Head, with Austin over the top, while Blues midfielder Adam Watkins was crowded out after a purposeful run. In the second half, Breeden had to come off his line smartly to save from Calcutt, while he also denied Watkins. However, with 15 minutes to go, the Brakes took the lead when Jack Edwards’s effort was deflected past Head. Blues tried to find a leveller as Wharton cut in but fired straight at the keeper, while Steve Gregory hit the post in a late effort but this was after the referee had blown for an infringement. Dunstable now slip to eighth as they trail the play-offs by three points ahead of a home clash against Merthyr Town this weekend, where the club will hold their fund-raising Race Night event at Creasey Park after the game. Leamington: Tony Breeden, Richard Taundry, Connor Gudger, Joe Magunda, Jamie Tank, James Mace, Lee Moore, Jack Edwards, Rob Ogleby (Ben Mackey), Courtney Baker-Richardson, Sam Austin. Subs not used: Ben George, James Fry, Ross Oulton, Eddie Caviezel-Cox. Dunstable: Jamie Head, Zack Reynolds, Howard Hall, Danny Talbot (Lee Roache), James Kaloczi, Adam Pepera, Adam Watkins, Steve Wales (David Keenleyside), Connor Calcutt (Chris Vardy), Steve Gregory, Gary Wharton. Sub not used: David Longe-King.